You are here: Home / Are Obama’s Appointees Complete Frauds? / Government / Are Obama’s Appointees Complete Frauds? Are Obama’s Appointees Complete Frauds? Columnist John C. Dovorak is one of my favorites. He writes for PC magazine and Marketwatch. He has been doing a little research on a couple the the Obama appointees namely CIO Vivek Kundra. It seems that Kundra is not who he says he is. Read the article here. Apparently there is no record of the degrees that he says he has. trying to actually verify his supposed MS in Information Technology from the University of Maryland, College Park campus. The registrar has no record of it. In fact the current University of Maryland grad department doesn’t even show this degree as being commonly available to anyone. A search of his college records shows no attendance after he received his BS degree in Psychology on 12/20/98. In fact his last day of school 12/19/98 wrapped up the six years it took Kundra to obtain his undergraduate degree. The article explains that the company that he ran was a one man operation that showed sales of $67,000. He apparently lied about teaching at University of Maryland. He has no idea about technology and he is apparently responsible for approving $18 million for a new recovery.gov website. You could have people updating the site by hand all day long for $18 million and you could do it for several years!! It may be laughable that Obama was hoodwinked and bamboozled this time, but it it OUR money that this FRAUD is spending. He was busted for stealing shirts from JCPenny’s in 1997. 12 years ago he was stealing from JCPenny and now he is stealing from me and you. That is quite a step up. Nice Job Kundra, nice due diligence Obama. And his sketchy background was disconcerting. It included a 1997 bust for stealing shirts from JC Penny’s and the later bust of his former staff by the FBI at the DC office during a bribery investigation. https://radioviceonline.com/wp-content/uploads/2011/02/rvo-logo-4-300x100.jpg 0 0 Erik Blazynski https://radioviceonline.com/wp-content/uploads/2011/02/rvo-logo-4-300x100.jpg Erik Blazynski2009-08-12 21:06:462009-08-12 21:12:15Are Obama's Appointees Complete Frauds? 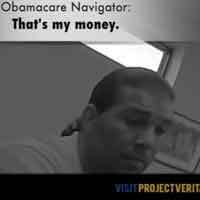 Obamacare navigator fraud video 2 ... "That's my money"
Are Obama's Czars Accountable to Anyone? 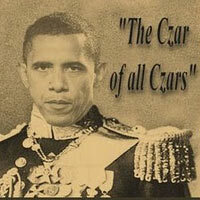 Will there be a Congressional review of Obama administration czars? Does anyone in this administration get vetted, including Obama himself? When I read "In fact his last day of school 12/19/98 wrapped up the six years it took Kundra to obtain his undergraduate degree", all I could think of was Bluto Blutarsky in Animal House, upon hearing that he was about to be expelled, saying "Seven years of college down the drain." LOLOL! In the movie, Blutarsky was supposed to have become a senator, but reality appears to be even more absurd. No, they are not complete frauds.